Not to be confused with Meteorite. 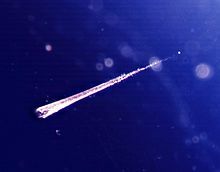 A meteoroid shown entering the atmosphere, becoming visible as a meteor and hitting the Earth's surface as a meteorite. A meteoroid (/ˈmiːtiərɔɪd/) is a small rocky or metallic body in outer space. Meteoroids are significantly smaller than asteroids, and range in size from small grains to one-meter-wide objects. Objects smaller than this are classified as micrometeoroids or space dust. Most are fragments from comets or asteroids, whereas others are collision impact debris ejected from bodies such as the Moon or Mars. When a meteoroid, comet, or asteroid enters Earth's atmosphere at a speed typically in excess of 20 km/s (72,000 km/h; 45,000 mph), aerodynamic heating of that object produces a streak of light, both from the glowing object and the trail of glowing particles that it leaves in its wake. This phenomenon is called a meteor or "shooting star". A series of many meteors appearing seconds or minutes apart and appearing to originate from the same fixed point in the sky is called a meteor shower. If that object withstands ablation from its passage through the atmosphere as a meteor and impacts with the ground, it is then called a meteorite. An estimated 25 million meteoroids, micrometeoroids and other space debris enter Earth's atmosphere each day, which results in an estimated 15,000 tonnes of that material entering the atmosphere each year. In 1961, the International Astronomical Union (IAU) defined a meteoroid as "a solid object moving in interplanetary space, of a size considerably smaller than an asteroid and considerably larger than an atom". In 1995, Beech and Steel, writing in the Quarterly Journal of the Royal Astronomical Society, proposed a new definition where a meteoroid would be between 100 µm and 10 m (33 ft) across. In 2010, following the discovery of asteroids below 10 m in size, Rubin and Grossman proposed a revision of the previous definition of meteoroid to objects between 10 µm and one meter (3 ft 3 in) in diameter in order to maintain the distinction. According to Rubin and Grossman, the minimum size of an asteroid is given by what can be discovered from Earth-bound telescopes, so the distinction between meteoroid and asteroid is fuzzy. Some of the smallest asteroids discovered (based on absolute magnitude H) are 2008 TS26 with H = 33.2 and 2011 CQ1 with H = 32.1 both with an estimated size of one m (3 ft 3 in). In April 2017, the IAU adopted an official revision of its definition, limiting size to between 30 µm and one meter in diameter, but allowing for a deviation for any object causing a meteor. Objects smaller than meteoroids are classified as micrometeoroids and interplanetary dust. The Minor Planet Center does not use the term "meteoroid". Almost all meteoroids contain extraterrestrial nickel and iron. They have three main classifications: iron, stone, and stony-iron. Some stone meteoroids contain grain-like inclusions known as chondrules and are called chondrites. Stony meteoroids without these features are called "achondrites", which are typically formed from extraterrestrial igneous activity; they contain little or no extraterrestrial iron. The composition of meteoroids can be inferred as they pass through Earth's atmosphere from their trajectories and the light spectra of the resulting meteor. Their effects on radio signals also give information, especially useful for daytime meteors, which are otherwise very difficult to observe. From these trajectory measurements, meteoroids have been found to have many different orbits, some clustering in streams (see meteor showers) often associated with a parent comet, others apparently sporadic. Debris from meteoroid streams may eventually be scattered into other orbits. The light spectra, combined with trajectory and light curve measurements, have yielded various compositions and densities, ranging from fragile snowball-like objects with density about a quarter that of ice, to nickel-iron rich dense rocks. The study of meteorites also gives insights into the composition of non-ephemeral meteoroids. Most meteoroids come from the asteroid belt, having been perturbed by the gravitational influences of planets, but others are particles from comets, giving rise to meteor showers. Some meteoroids are fragments from bodies such as Mars or our moon, that have been thrown into space by an impact. Meteoroids travel around the Sun in a variety of orbits and at various velocities. The fastest move at about 42 km/s (94,000 mph) through space in the vicinity of Earth's orbit. This is escape velocity from the Sun, equal to the square root of two times Earth's speed, and is the upper speed limit of objects in the vicinity of Earth, unless they come from interstellar space. Earth travels at about 29.6 km/s (66,000 mph), so when meteoroids meet the atmosphere head-on (which only occurs when meteors are in a retrograde orbit such as the Eta Aquarids, which are associated with the retrograde Halley's Comet) the combined speed may reach about 71 km/s (160,000 mph) (see Specific energy#Astrodynamics). Meteoroids moving through Earth's orbital space average about 20 km/s (45,000 mph). On January 17, 2013 at 05:21 PST, a one meter-sized comet from the Oort cloud entered Earth atmosphere over California and Nevada. The object had a retrograde orbit with perihelion at 0.98 ± 0.03 AU. It approached from the direction of the constellation Virgo (which was in the south about 50° above the horizon at the time), and collided head-on with Earth's atmosphere at 72 ± 6 km/s (161,000 ± 13,000 mph) vapourising more than 100 km (330,000 ft) above ground over a period of several seconds. When meteoroids intersect with Earth's atmosphere at night, they are likely to become visible as meteors. If meteoroids survive the entry through the atmosphere and reach Earth's surface, they are called meteorites. Meteorites are transformed in structure and chemistry by the heat of entry and force of impact. 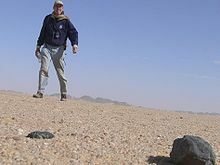 A noted 4-metre (13 ft) asteroid, 2008 TC3, was observed in space on a collision course with Earth on 6 October 2008 and entered Earth's atmosphere the next day, striking a remote area of northern Sudan. It was the first time that a meteoroid had been observed in space and tracked prior to impacting Earth. NASA has produced a map showing the most notable asteroid collisions with Earth and its atmosphere from 1994 to 2013 from data gathered by U.S. government sensors (see below). 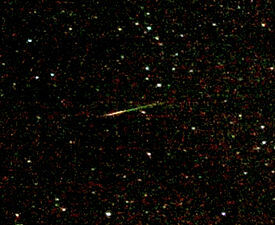 A meteor, known colloquially as a shooting star or falling star, is the visible passage of a glowing meteoroid, micrometeoroid, comet or asteroid through Earth's atmosphere, after being heated to incandescence by collisions with air molecules in the upper atmosphere, creating a streak of light via its rapid motion and sometimes also by shedding glowing material in its wake. Although a meteor may seem to be a few thousand feet from the Earth, meteors typically occur in the mesosphere at altitudes from 76 to 100 km (250,000 to 330,000 ft). 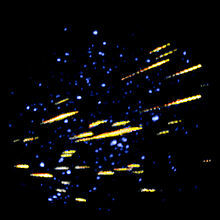 The root word meteor comes from the Greek meteōros, meaning "high in the air". Millions of meteors occur in Earth's atmosphere daily. Most meteoroids that cause meteors are about the size of a grain of sand, i.e. they are usually millimeter-sized or smaller. Meteoroid sizes can be calculated from their mass and density which, in turn, can be estimated from the observed meteor trajectory in the upper atmosphere. Meteors may occur in showers, which arise when Earth passes through a stream of debris left by a comet, or as "random" or "sporadic" meteors, not associated with a specific stream of space debris. A number of specific meteors have been observed, largely by members of the public and largely by accident, but with enough detail that orbits of the meteoroids producing the meteors have been calculated. The atmospheric velocities of meteors result from the movement of Earth around the Sun at about 30 km/s (67,000 mph), the orbital speeds of meteoroids, and the gravity well of Earth. Meteors become visible between about 75 to 120 km (250,000 to 390,000 ft) above Earth. They usually disintegrate at altitudes of 50 to 95 km (160,000 to 310,000 ft). Meteors have roughly a fifty percent chance of a daylight (or near daylight) collision with Earth. Most meteors are, however, observed at night, when darkness allows fainter objects to be recognized. For bodies with a size scale larger than 10 cm (3.9 in) to several meters meteor visibility is due to the atmospheric ram pressure (not friction) that heats the meteoroid so that it glows and creates a shining trail of gases and melted meteoroid particles. The gases include vaporised meteoroid material and atmospheric gases that heat up when the meteoroid passes through the atmosphere. Most meteors glow for about a second. Although meteors have been known since ancient times, they were not known to be an astronomical phenomenon until early in the nineteenth century. Prior to that, they were seen in the West as an atmospheric phenomenon, like lightning, and were not connected with strange stories of rocks falling from the sky. In 1807, Yale University chemistry professor Benjamin Silliman investigated a meteorite that fell in Weston, Connecticut. Silliman believed the meteor had a cosmic origin, but meteors did not attract much attention from astronomers until the spectacular meteor storm of November 1833. People all across the eastern United States saw thousands of meteors, radiating from a single point in the sky. Astute observers noticed that the radiant, as the point is now called, moved with the stars, staying in the constellation Leo. The astronomer Denison Olmsted made an extensive study of this storm, and concluded that it had a cosmic origin. After reviewing historical records, Heinrich Wilhelm Matthias Olbers predicted the storm's return in 1867, which drew the attention of other astronomers to the phenomenon. Hubert A. Newton's more thorough historical work led to a refined prediction of 1866, which proved to be correct. With Giovanni Schiaparelli's success in connecting the Leonids (as they are now called) with comet Tempel-Tuttle, the cosmic origin of meteors was now firmly established. Still, they remain an atmospheric phenomenon, and retain their name "meteor" from the Greek word for "atmospheric". A fireball is a brighter-than-usual meteor. The International Astronomical Union (IAU) defines a fireball as "a meteor brighter than any of the planets" (apparent magnitude −4 or greater). The International Meteor Organization (an amateur organization that studies meteors) has a more rigid definition. It defines a fireball as a meteor that would have a magnitude of −3 or brighter if seen at zenith. This definition corrects for the greater distance between an observer and a meteor near the horizon. For example, a meteor of magnitude −1 at 5 degrees above the horizon would be classified as a fireball because, if the observer had been directly below the meteor, it would have appeared as magnitude −6. Fireballs reaching apparent magnitude −14 or brighter are called bolides. The IAU has no official definition of "bolide", and generally considers the term synonymous with "fireball". Astronomers often use "bolide" to identify an exceptionally bright fireball, particularly one that explodes. They are sometimes called detonating fireballs (also see List of meteor air bursts). It may also be used to mean a fireball which creates audible sounds. 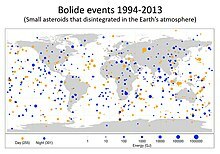 In the late twentieth century, bolide has also come to mean any object that hits Earth and explodes, with no regard to its composition (asteroid or comet). The word bolide comes from the Greek βολίς (bolis)  which can mean a missile or to flash. If the magnitude of a bolide reaches −17 or brighter it is known as a superbolide. A relatively small percentage of fireballs hit Earth's atmosphere and then pass out again: these are termed Earth-grazing fireballs. Such an event happened in broad daylight over North America in 1972. Another rare phenomena is a meteor procession, where the meteor breaks up into several fireballs traveling nearly parallel to the surface of Earth. A steadily growing number of fireballs are recorded at the American Meteor Society every year. There are probably more than 500,000 fireballs a year, but most will go unnoticed because most will occur over the ocean and half will occur during daytime. The entry of meteoroids into Earth's atmosphere produces three main effects: ionization of atmospheric molecules, dust that the meteoroid sheds, and the sound of passage. During the entry of a meteoroid or asteroid into the upper atmosphere, an ionization trail is created, where the air molecules are ionized by the passage of the meteor. Such ionization trails can last up to 45 minutes at a time. Small, sand-grain sized meteoroids are entering the atmosphere constantly, essentially every few seconds in any given region of the atmosphere, and thus ionization trails can be found in the upper atmosphere more or less continuously. When radio waves are bounced off these trails, it is called meteor burst communications. Meteor radars can measure atmospheric density and winds by measuring the decay rate and Doppler shift of a meteor trail. Most meteoroids burn up when they enter the atmosphere. The left-over debris is called meteoric dust or just meteor dust. Meteor dust particles can persist in the atmosphere for up to several months. These particles might affect climate, both by scattering electromagnetic radiation and by catalyzing chemical reactions in the upper atmosphere. Meteoroids or their fragments may achieve dark flight after deceleration to terminal velocity. Dark flight starts when they decelerate to about 2–4 km/s (4,500–8,900 mph). Larger fragments will fall further down the strewn field. Sound generated by a meteor in the upper atmosphere, such as a sonic boom, typically arrives many seconds after the visual light from a meteor disappears. 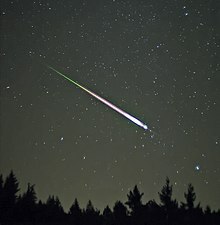 Occasionally, as with the Leonid meteor shower of 2001, "crackling", "swishing", or "hissing" sounds have been reported, occurring at the same instant as a meteor flare. Similar sounds have also been reported during intense displays of Earth's auroras. A meteor shower is the result of an interaction between a planet, such as Earth, and streams of debris from a comet or other source. The passage of Earth through cosmic debris from comets and other sources is a recurring event in many cases. Comets can produce debris by water vapor drag, as demonstrated by Fred Whipple in 1951, and by breakup. Each time a comet swings by the Sun in its orbit, some of its ice vaporizes and a certain amount of meteoroids will be shed. The meteoroids spread out along the entire orbit of the comet to form a meteoroid stream, also known as a "dust trail" (as opposed to a comet's "dust tail" caused by the very small particles that are quickly blown away by solar radiation pressure). The Peekskill Meteorite was filmed on October 9, 1992 by at least 16 independent videographers. Eyewitness accounts indicate the fireball entry of the Peekskill meteorite started over West Virginia at 23:48 UT (±1 min). The fireball, which traveled in a northeasterly direction, had a pronounced greenish colour, and attained an estimated peak visual magnitude of −13. During a luminous flight time that exceeded 40 seconds the fireball covered a ground path of some 430 to 500 mi (700 to 800 km). 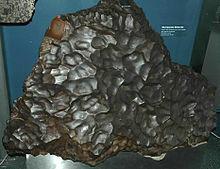 One meteorite recovered at Peekskill, New York, for which the event and object gained their name, had a mass of 27 lb (12.4 kg) and was subsequently identified as an H6 monomict breccia meteorite. The video record suggests that the Peekskill meteorite had several companions over a wide area. The companions are unlikely to be recovered in the hilly, wooded terrain in the vicinity of Peekskill. A large fireball was observed in the skies near Bone, Indonesia on October 8, 2009. This was thought to be caused by an asteroid approximately 10 m (33 ft) in diameter. The fireball contained an estimated energy of 50 kilotons of TNT, or about twice the Nagasaki atomic bomb. No injuries were reported. A large bolide was reported on 18 November 2009 over southeastern California, northern Arizona, Utah, Wyoming, Idaho and Colorado. At 00:07 local time a security camera at the high altitude W. L. Eccles Observatory (9,610 ft (2,930 m) above sea level) recorded a movie of the passage of the object to the north. Of particular note in this video is the spherical "ghost" image slightly trailing the main object (this is likely a lens reflection of the intense fireball), and the bright fireball explosion associated with the breakup of a substantial fraction of the object. An object trail can be seen to continue northward after the bright fireball event. The shock from the final breakup triggered seven seismological stations in northern Utah; a timing fit to the seismic data yielded a terminal location of the object at 40.286 N, -113.191 W, altitude 90,000 ft (27 km). This is above the Dugway Proving Grounds, a closed Army testing base. The Chelyabinsk meteor was an extremely bright, exploding fireball, known as superbolide, measuring about 17 to 20 m (56 to 66 ft) across, with an estimated initial mass of 11,000 tonnes, as the relatively small asteroid entered Earth's atmosphere. It was the largest known natural object to have entered Earth's atmosphere since the Tunguska event in 1908. Over 1,500 people were injured mostly by glass from shattered windows caused by the air burst approximately 25 to 30 km (80,000 to 100,000 ft) above the environs of Chelyabinsk, Russia on 15 February 2013. An increasingly bright streak was observed during morning daylight with a large contrail lingering behind. At no less than 1 minute and up to at least 3 minutes after the object peaked in intensity (depending on distance from trail), a large concussive blast was heard that shattered windows and set-off car alarms, which was followed by a number of smaller explosions. Meteoroids also hit other bodies in the Solar System. On such stony bodies as the Moon or Mars that have little or no atmosphere, they leave enduring craters. where N (>D) is the expected number of objects larger than a diameter of D meters to hit Earth in a year. This is based on observations of bright meteors seen from the ground and space, combined with surveys of near-Earth asteroids. Above 300 m (980 ft) in diameter, the predicted rate is somewhat higher, with a two kilometres (one point two miles) asteroid (one million-megaton TNT equivalent) every couple of million years — about 10 times as often as the power-law extrapolation would predict. Meteoroid collisions with solid Solar System objects, including the Moon, Mercury, Callisto, Ganymede, and most small moons and asteroids, create impact craters, which are the dominant geographic features of many of those objects. On other planets and moons with active surface geological processes, such as Earth, Venus, Mars, Europa, Io, and Titan, visible impact craters may become eroded, buried, or transformed by tectonics over time. In early literature, before the significance of impact cratering was widely recognised, the terms cryptoexplosion or cryptovolcanic structure were often used to describe what are now recognised as impact-related features on Earth. Molten terrestrial material ejected from a meteorite impact crater can cool and solidify into an object known as a tektite. These are often mistaken for meteorites. ^ "meteoroid Meaning in the Cambridge English Dictionary". dictionary.cambridge.org. ^ Atkinson, Nancy (2 June 2015). "What is the difference between asteroids and meteorites?". Universe Today. ^ "meteoroids". The Free Dictionary. Retrieved 1 August 2015. ^ "Meteoroid". National Geographic. Archived from the original on 7 October 2015. Retrieved 24 August 2015. ^ "Meteors & Meteorites". NASA. Retrieved 1 August 2015. ^ "Asteroid Fast Facts". NASA. 31 March 2014. Retrieved 1 August 2015. ^ Lidz, Franz (2019-01-09). "The Oldest Material in the Smithsonian Institution Came From Outer Space". Smithsonian. Retrieved 2019-01-09. ^ Gary, Stuart (2011-12-22). "Survey finds not all meteors the same". ABC Science. ABC. ^ a b c "Glossary International Meteor Organization". International Meteor Organization (IMO). Retrieved 2011-09-16. ^ Millman, Peter M. (1961). "A report on meteor terminology". Journal of the Royal Astronomical Society of Canada. 55: 265–267. Bibcode:1961JRASC..55..265M. ^ "JPL Small-Body Database Search Engine: H > 29 (mag)". JPL Solar System Dynamics. Retrieved 2013-01-28. ^ "JPL Small-Body Database Browser: (2011 CQ1)" (2011-02-04 last obs). ^ Yeomans, Donald K.; Chodas, Paul; Chesley, Steve (November 9, 2009). "Small Asteroid 2009 VA Whizzes By the Earth". NASA's Near Earth Object Program Office. Retrieved 2013-01-28. ^ Vincent Perlerin (September 26, 2017). "Definitions of terms in meteor astronomy (IAU)". News. International Meteor Organization. Retrieved 2018-01-22. ^ Notkin, Geoffrey. "Meteorite types and classification". Meteorwritings. Geology.com. Retrieved 2014-03-02. ^ Povenmire, Harold (2000). "Physical Dynamics of the Upsilon Pegasid Fireball – European Network 190882A" (PDF). Lunar and Planetary Science Conference: 1183. Bibcode:2000LPI....31.1183P. ^ Interagency Group (Space) Working Group on Orbital Debris. "Report on Orbital Debris". NASA. NASA Technical Reports Server: 1. hdl:2060/19900003319. ^ a b Jenniskens, Peter. "2013 January 17 Sierra Nevada fireball". SETI Institute. Retrieved 2014-11-16. | "Earth Collides Head-On with Small Comet". SETI Institute. ^ "Cosmic Fireball Falling Over ALMA". ESO Picture of the Week. Retrieved 10 April 2014. ^ Reyes, Tim (17 November 2014). "We are not Alone: Government Sensors Shed New Light on Asteroid Hazards". Universe Today. Retrieved 12 April 2015. ^ a b Editors. "Merriam-Webster Dictionary". Encyclopædia Britannica. Retrieved 2014-09-21. ^ Bronshten, V. A. (Dec 6, 2012). Physics of Meteoric Phenomena. Science. Springer Science & Business Media. p. 358. ISBN 9789400972223. ^ Erickson, Philip J. "Millstone Hill UHF Meteor Observations: Preliminary Results". Archived from the original on 2016-03-05. ^ Subasinghe, Dilini (2018). "Luminous Efficiency Estimates of Meteors". Astronomical Journal. 155 (2): 88. arXiv:1801.06123. doi:10.3847/1538-3881/aaa3e0. ^ Jenniskens, Peter (2006). Meteor Showers and their Parent Comets. New York: Cambridge University Press. p. 372. ISBN 978-0521853491. ^ Taibi, Richard. "The Early Years of Meteor Observations in the USA". American Meteor Society. 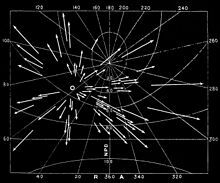 ^ a b Kronk, Gary W. "The Leonids and the Birth of Meteor Astronomy". Meteorshowers Online. Archived from the original on January 22, 2009. ^ Hitchcock, Edward (January 1834). "On the Meteors of Nov. 13, 1833". The American Journal of Science and Arts. XXV. ^ "October's Orionid Meteors". Astro Prof. Archived from the original on March 4, 2016. ^ Zay, George (1999-07-09). "MeteorObs Explanations and Definitions (states IAU definition of a fireball)". Meteorobs.org. Archived from the original on 2011-10-01. Retrieved 2011-09-16. ^ "International Meteor Organization - Fireball Observations". imo.net. 2004-10-12. Retrieved 2011-09-16. ^ a b Di Martino, Mario; Cellino, Alberto (2004). "Physical properties of comets and asteroids inferred from fireball observations". In Belton, Michael J. S.; Morgan, Thomas H.; Samarasinha, Nalin; et al. (eds.). Mitigation of hazardous comets and asteroids. Cambridge University Press. p. 156. ISBN 978-0-521-82764-5. ^ Rogers, John J. W. (1993). A History of the Earth. Cambridge University Press. p. 251. ISBN 9780521397827. ^ Adushkin, Vitaly; Nemchinov, Ivan (2008). Catastrophic events caused by cosmic objects. Springer. p. 133. Bibcode:2008cecc.book.....A. ISBN 978-1-4020-6451-7. ^ a b American Meteor Society. "Fireball Logs". Retrieved 2016-09-28. ^ "Fireball FAQs". American Meteor Society. Retrieved 2013-03-21. ^ Kanipe, Jeff (14 September 2006). "Climate change: A cosmic connection". Nature. 443 (7108): 141–143. Bibcode:2006Natur.443..141K. doi:10.1038/443141a. PMID 16971922. ^ "Fireballs and Meteorite Falls". International Meteor Organization. Retrieved 2013-03-05. ^ "Fireball FAQS". American Meteor Society. Retrieved 2013-03-05. ^ Editors. "Background facts on meteors and meteor showers". NASA. Retrieved 2014-02-24. ^ Burdick, Alan (2002). "Psst! Sounds like a meteor: in the debate about whether or not meteors make noise, skeptics have had the upper hand until now". Natural History. Archived from the original on 2012-07-15. ^ Vaivads, Andris (2002). "Auroral Sounds". Retrieved 2011-02-27. ^ "Auroral Acoustics". Laboratory of Acoustics and Audio Signal Processing, Helsinki University of Technology. Retrieved 2011-02-17. ^ Silverman, Sam M.; Tuan, Tai-Fu (1973). Auroral Audibility. Advances in Geophysics. 16. pp. 155–259. Bibcode:1973AdGeo..16..155S. doi:10.1016/S0065-2687(08)60352-0. ISBN 9780120188161. ^ Keay, Colin S. L. (1990). "C. A. Chant and the Mystery of Auroral Sounds". Journal of the Royal Astronomical Society of Canada. 84: 373–382. Bibcode:1990JRASC..84..373K. ^ "Listening to Leonids". science.nasa.gov. Archived from the original on 2009-09-08. Retrieved 2011-09-16. ^ Sommer, H. C.; Von Gierke, H. E. (September 1964). "Hearing sensations in electric fields". Aerospace Medicine. 35: 834–839. PMID 14175790. Extract text archive. ^ Frey, Allan H. (1 July 1962). "Human auditory system response to modulated electromagnetic energy". Journal of Applied Physiology. 17 (4): 689–692. doi:10.1152/jappl.1962.17.4.689. PMID 13895081. Retrieved 7 February 2016. Full text archive. ^ Frey, Allan H.; Messenger, Rodman (27 Jul 1973). "Human Perception of Illumination with Pulsed Ultrahigh-Frequency Electromagnetic Energy". Science. 181 (4097): 356–358. Bibcode:1973Sci...181..356F. doi:10.1126/science.181.4097.356. Full text archive. ^ Riley, Chris (1999-04-21). "Sound of shooting stars". BBC News. Retrieved 2011-09-16. ^ Whipple, Fred (1951). "A Comet Model. II. Physical Relations for Comets and Meteors" (PDF). Astrophysical Journal. 113: 464–474. Bibcode:1951ApJ...113..464W. doi:10.1086/145416. ^ Phillips, Tony. "Spring is Fireball Season". science.nasa.gov. Retrieved 2011-09-16. ^ Coulter, Dauna (2011-03-01). "What's Hitting Earth?". science.nasa.gov. Retrieved 2011-09-16. ^ "The Peekskill Meteorite 9 October 1992 Videos". ^ Brown, Peter; Ceplecha, Zedenek; Hawkes, Robert L.; Wetherill, George W.; Beech, Martin; Mossman, Kaspar (1994). "The orbit and atmospheric trajectory of the Peekskill meteorite from video records". Nature. 367 (6464): 624–626. Bibcode:1994Natur.367..624B. doi:10.1038/367624a0. ^ Wlotzka, Frank (1993). "The Meteoritical Bulletin, No. 75, 1993 December". Meteoritics. 28 (5): 692–703. doi:10.1111/j.1945-5100.1993.tb00641.x. ^ Yeomans, Donald K.; Chodas, Paul; Chesley, Steve (October 23, 2009). "Asteroid Impactor Reported over Indonesia". NASA/JPL Near-Earth Object Program Office. Retrieved 2009-10-30. ^ "W. L. Eccles Observatory, November 18, 2009, North Camera". YouTube. 2009-11-18. Retrieved 2011-09-16. 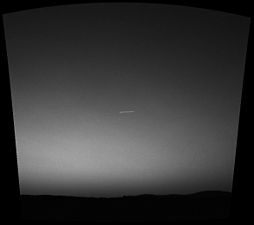 ^ "W. L. Eccles Observatory, November 18, 2009, North West Camera". YouTube. 2009-11-18. Retrieved 2011-09-16. ^ Yeomans, Don; Chodas, Paul (1 March 2013). "Additional Details on the Large Fireball Event over Russia on Feb. 15, 2013". NASA/JPL Near-Earth Object Program Office. Retrieved 2 March 2013. ^ JPL (2012-02-16). "Russia Meteor Not Linked to Asteroid Flyby". Retrieved 2013-02-19. ^ "Meteorite slams into Central Russia injuring 1100 - as it happened". Guardian. 15 February 2013. Retrieved 16 February 2013. ^ "What is a Bolide?". woodshole.er.usgs.gov. Retrieved 2011-09-16. ^ Brown, Peter; Spalding, Richard E.; ReVelle, Douglas O.; Tagliaferri, Edward; Worden, Simon P. (21 September 2002). "The flux of small near-Earth objects colliding with the Earth". Nature. 420 (6913): 294–296. Bibcode:2002Natur.420..294B. doi:10.1038/nature01238. PMID 12447433. ^ French, Bevan M. (1998). "Traces of Catastrophe: A Handbook of Shock-Metamorphic Effects in Terrestrial Meteorite Impact Structures". Washington, DC: Smithsonian Institution. p. 97. ^ "Northwest Africa 869". Meteoritical Bulletin Database. The Meteoritical Society. Look up meteoroid or meteor in Wiktionary, the free dictionary.